Our range of products include metal stitching of 13.5 mw engine block, turbine shaft polishing, turbine casting repair, on site crankshaft grinding machine, white metal engine bearing and skoda bearing. Due to an accident, upper portion of engine block/engine entablature was broken. On inspection of engine block, it was found that a upper engine block cast iron piece measuring 108 inches x 72 inches was broken in to pieces. New cast iron piece was cast, metal stitched and metal locked and engine block/engine entablature is successfully repaired. Engine is performing satisfactory. Turbine shaft polishing up to diameter of 1500 mm is done. 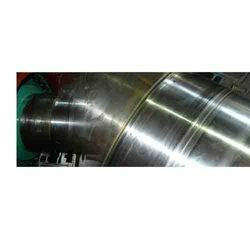 The turbine shaft polishing is undertaken onsite without removing the turbine shaft from the main equipment. Tolerances as per the manufacturer are strictly maintained. White metal Babbitt turbine bearings are manufactured and rebabbitting of old white metal bearings is done. 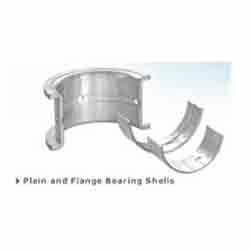 In case of damage of turbine casting due to an accident, it is easily repaired by metal stitching and metal locking process onsite. We undertake grinding and polishing of turbine shaft, manufacturing of turbine white metal babbitt bearing and rebabbitting of old white metal turbine bearing. On Site crankshaft grinding machine is developed and manufactured by RA Power Solutions. It is portable and easy to operate. Crankshaft grinding machine can undertake grinding and polishing of crankshaft, rotor shaft, turbine shaft, alternator shaft, pump shaft without removal from the engine block or casing. RA Power Solutions provide on job training and supplies crankshaft grinding machine complete in all respect ready to use. It is latest design of grinding machine capable of maintaining tolerances as per manufacturer’s specifications. White metal engine bearing are manufactured up to 1500 mm inner diameter. The new white metal bearing of engine as per drawing and as per sample are manufactured by us. 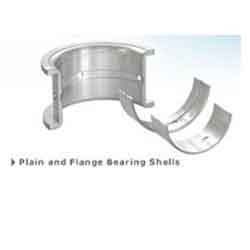 Rebabbitting of white metal engine bearing is done by centrifugal system which ensures perfect bonding with steel base. 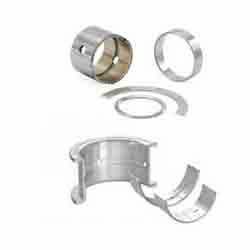 CKD Skoda bearings are available in stock. 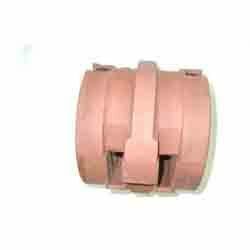 We have standard and undersize CKD Skoda bearings for 2270 KVA engines. The white metal Babbitt bearing for all models of CKD DG sets are available in stock. Rebabbitting of CKD Skoda engine bearings Is undertaken with guarantee. 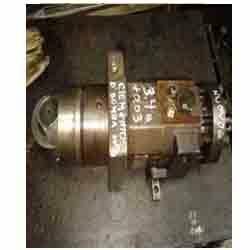 CKD Skoda spares are available in stock we maintain stock of CKD Skoda Diesel generating sets. 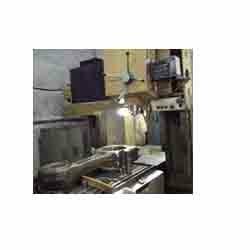 In case of development of crack or broken casting of lower crank case, Entablature, cylinder heads and cast iron parts we undertake crack repair by cold process called metal locking and metal stitching. The broken casting is replaced by new casting of engine block which is generally of cast iron and is metal stitched and metal locked. 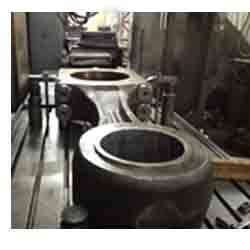 The crack repair of engine block, cylinder heads, Turbocharger casing and all cast iron components of Diesel engine are repaired by metal locking and metal stitching process and are guaranteed for satisfactory performance. The broken casting repair and crack repair of engine parts is done onsite and there is no need of disassembly of the engine. RA Power Solutions is the only company which can undertake repair of crack in cast iron casting while sailing of the vessel and have four decades of experience in metal stitching and metal locking. Crack in engine block, cylinder head, turbocharger casing and all cast iron spares are repaired by metal surgery process. This process of crack repair is cold as it doesn’t generate any heat and is successful. Engine block repair is possible while sailing of the vessel. Repair of 6 MW cracked engine block has been executed by RA Power Solutions. The crack engine block of Wartsila was successfully repaired by use of special alloy keys to undertake metal locking and metal stitching. Cylinder liner honing of all makes of engine like ABB, ABC, Anglo Belgian Corporation, Akasaka, Alco Diesel Engines, Alfa Laval, Allen, Alpha Diesel, Alstom, B & W, Bergen Diesel Engines, Blackstone, Bosch, Caterpillar, Cegielski, Consilium, Crepelle, Cummins, Daihatsu, Detroit Diesel, Deutz, Deutz Marine Engine, EMD, Fiat, FUJI, Fuji Diesel, Furuno, Hanshin, Headway, HIMSEN, Holset, Hyundai, JRC, Kawasaki, Kelvin Hughes, Kongsberg Maritime, L'Orange Maschinenfabrik, MaK, MAN, MAN B&W, Martek Marine, Mirrlees Blackstone, Mitsubishi, Mitsubishi UE/UEC, MTU, MWM, Napier, NAVTEX, Nigata, Nohab Diesel, Paxman, Pielstick, Ruston & Hornsby, Samsung, Simrad, SKL, Sperry, Stork SW Diesel, Stork Werkspoor, STORK-WARTSILA DIESEL, Sulzer, Volvo Penta, Wartsila, Wartsila Diesel, Westfalia, Wichmann, Woodward, Yanmar is undertaken. 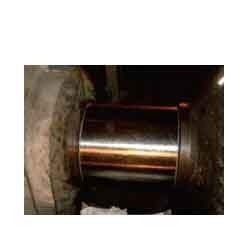 We can undertake honing of cylinder liners up to 1500 mm bore. 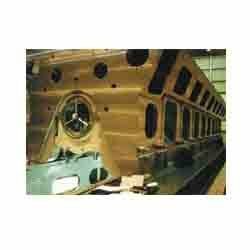 RA Power Solutions also sells Chris marine honing machines on low prices. New and reconditioned liners of above make of Engines are available in stock. Cylinder liner of all high capacity engines like Wartsila, Caterpillar, Deutz Marine Engine, Mirrlees Blackstone, Mitsubishi, etc. 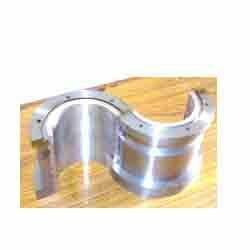 are manufactured up to 1500 mm bore size. Cylinder liners are centrifugally cast, machined and honed in house. 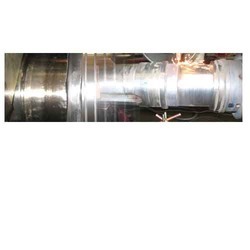 Cylinder liners can be manufactured as per the drawing of the liner or even as per the sample. 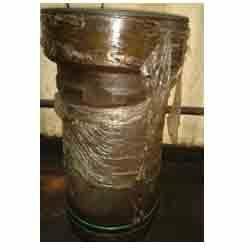 We maintain large stock of used cylinder liners. 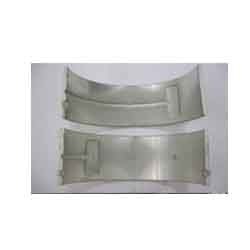 These liners are honed and have life cycle of as much of new liner. The reconditioned cylinder liners are generally priced 1/3rd of new cylinder liner. 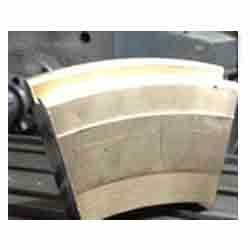 On Site crankshaft grinding and polishing is undertaken upto 700 mm. The crankshaft grinding and crankshaft polishing is possible on board the vessel while sailing. Daihatsu engine bearing of standard and undersize are available. Crankpin and main journal bearing of Daihatsu engine are available in ready stock. Crankshaft CR and Main journal bearings of popular make of Engines are available ready in stock. Journal and crankpin bearing of marine engine are available in stock. 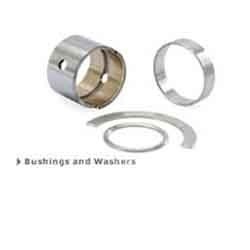 White metal, bimetallic and thin shell type trimetal bearings for all engines like ABB, ABC, Anglo Belgian Corporation, Akasaka, Alco Diesel Engines, Alfa Laval, Allen, Alpha Diesel, Alstom, B & W, Bergen Diesel Engines, Blackstone, Bosch, Caterpillar, Cegielski, Consilium, Crepelle, Cummins, Daihatsu, Detroit Diesel, Deutz, Deutz Marine Engine, EMD, Fiat, FUJI, Fuji Diesel, Furuno, Hanshin, Headway, HIMSEN, Holset, Hyundai, JRC, Kawasaki, Kelvin Hughes, Kongsberg Maritime, L'Orange Maschinenfabrik, MaK, MAN, MAN B&W, Martek Marine, Mirrlees Blackstone, Mitsubishi, Mitsubishi UE/UEC, MTU, MWM, Napier, NAVTEX, Nigata, Nohab Diesel, Paxman, Pielstick, Ruston & Hornsby, Samsung, Simrad, SKL, Sperry, Stork SW Diesel, Stork Werkspoor, STORK-WARTSILA DIESEL, Sulzer, Volvo Penta, Wartsila, Wartsila Diesel, Westfalia, Wichmann, Woodward, Yanmar are also supplied. 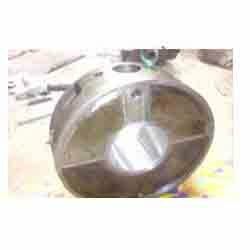 Alternator bearing as per the sample or as per the drawing are manufactured. 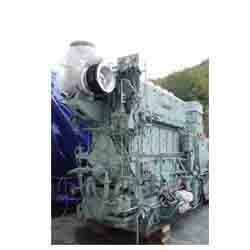 Generally alternator bearing of diesel generating sets is of white metal. We undertake rebabbitting of old white metal bearings. 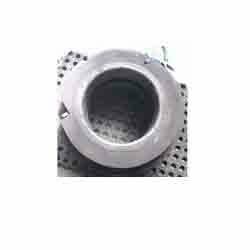 Mop governor bearing of 210 MW turbine are manufactured and rebabbitting of white metal as per specified grade is undertaken. Engine Bearing of ABB, ABC, Anglo Belgian Corporation, Akasaka, Alco Diesel Engines, Alfa Laval, Allen, Alpha Diesel, Alstom, B & W, Bergen Diesel Engines, Blackstone, Bosch, Caterpillar, Cegielski, Consilium, Crepelle, Cummins, Daihatsu, Detroit Diesel, Deutz, Deutz Marine Engine, EMD, Fiat, FUJI, Fuji Diesel, Furuno, Hanshin, Headway, HIMSEN, Holset, Hyundai, JRC, Kawasaki, Kelvin Hughes, Kongsberg Maritime, L'Orange Maschinenfabrik, MaK, MAN, MAN B&W, Martek Marine, Mirrlees Blackstone, Mitsubishi, Mitsubishi UE/UEC, MTU, MWM, Napier, NAVTEX, Nigata, Nohab Diesel, Paxman, Pielstick, Ruston & Hornsby, Samsung, Simrad, SKL, Sperry, Stork SW Diesel, Stork Werkspoor, STORK-WARTSILA DIESEL, Sulzer, Volvo Penta, Wartsila, Wartsila Diesel, Westfalia, Wichmann, Woodward, Yanmar are available in stock. We specialize in undersize and special size crankpin and main journal bearings. 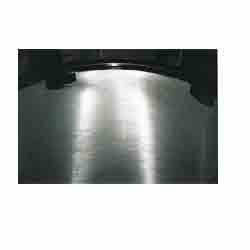 : Rebabbitting of pedestrial bearing is undertaken up to 1500 mm. The white metal used by us is imported from Spain and rebabbitting is done by centrifugal system. Bearings after rebabbitting are subject to ultrasound for bonding of white metal and are dimensionally checked. New turbine bearings of white Babbitt metal are manufactured strictly as per the drawing and sample. Performance of turbine white metal Babbitt bearing is guaranteed. Rebabbitting of turbine bearing is undertaken. 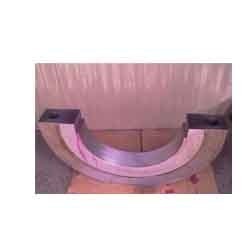 600 MW turbine pad bearing are supplied and performing satisfactory. 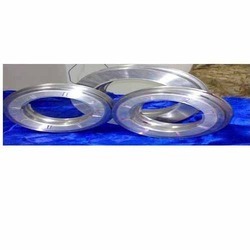 Turbine pad bearing are manufactured of high grade Babbitt white metal. 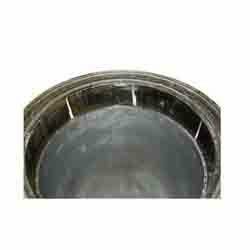 Mop governor bearing 210 MW turbine are supplied after white metal rebabbitting. Governor bearing have crossed more than 8000 hours of operation. Tri metal, bi metal and white metal bearings are manufactured and marketed for engine like ABB, ABC, Anglo Belgian Corporation, Akasaka, Alco Diesel Engines, Alfa Laval, Allen, Alpha Diesel, Alstom, B & W, Bergen Diesel Engines, Blackstone, Bosch, Caterpillar, Cegielski, Consilium, Crepelle, Cummins, Daihatsu, Detroit Diesel, Deutz, Deutz Marine Engine, EMD, Fiat, FUJI, Fuji Diesel, Furuno, Hanshin, Headway, HIMSEN, Holset, Hyundai, JRC, Kawasaki, Kelvin Hughes, Kongsberg Maritime, L'Orange Maschinenfabrik, MaK, MAN, MAN B&W, Martek Marine, Mirrlees Blackstone, Mitsubishi, Mitsubishi UE/UEC, MTU, MWM, Napier, NAVTEX, Nigata, Nohab Diesel, Paxman, Pielstick, Ruston & Hornsby, Samsung, Simrad, SKL, Sperry, Stork SW Diesel, Stork Werkspoor, STORK-WARTSILA DIESEL, Sulzer, Volvo Penta, Wartsila, Wartsila Diesel, Westfalia, Wichmann, Woodward, Yanmar. CKD Skoda bearing of 2270 KVA and all capacities are available in stock. Crankpin, main journal bearings and under size bearing for CKD Skoda are available in stock. 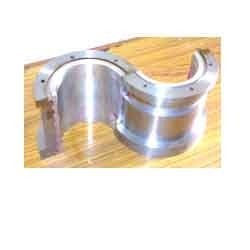 600 MW turbine pad bearing are manufactured and supplied to a leading power plant in India which are performing satisfactory. 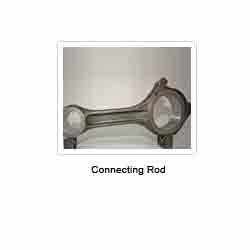 Reconditioning is undertaken for all dimensions of big end and small end of connecting rods and are maintained as per manufacturers specification. Connecting rods are checked after reconditioning for straightness. Connecting rod repair is done by experienced engineers. Used, reconditioned connecting rod of following make of engine ABB, ABC, Anglo Belgian Corporation, Akasaka, Alco Diesel Engines, Alfa Laval, Allen, Alpha Diesel, Alstom, B & W, Bergen Diesel Engines, Blackstone, Bosch, Caterpillar, Cegielski, Consilium, Crepelle, Cummins, Daihatsu, Detroit Diesel, Deutz, Deutz Marine Engine, EMD, Fiat, FUJI, Fuji Diesel, Furuno, Hanshin, Headway, HIMSEN, Holset, Hyundai, JRC, Kawasaki, Kelvin Hughes, Kongsberg Maritime, L'Orange Maschinenfabrik, MaK, MAN, MAN B&W, Martek Marine, Mirrlees Blackstone, Mitsubishi, Mitsubishi UE/UEC, MTU, MWM, Napier, NAVTEX, Nigata, Nohab Diesel, Paxman, Pielstick, Ruston & Hornsby, Samsung, Simrad, SKL, Sperry, Stork SW Diesel, Stork Werkspoor, STORK-WARTSILA DIESEL, Sulzer, Volvo Penta, Wartsila, Wartsila Diesel, Westfalia, Wichmann, Woodward, Yanmar are available in stock. Cost of reconditioned/second hand connecting are 1/3rd of new connecting rods. Marine engine connecting rods are inspected and reconditioned if required. In-house facilities for checking of cracks, re-boring of big end and small end of connecting are available. Marine Engine connecting rods are exported by us all over the world. On site crankshaft grinding of crank pin and main journal is undertaken up to 700 mm without removing crankshaft from engine block. 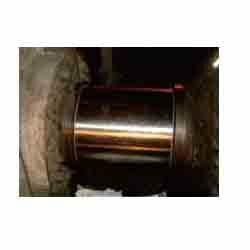 Crankpin and main journal tolerances of Crankshaft are maintained as per manual.